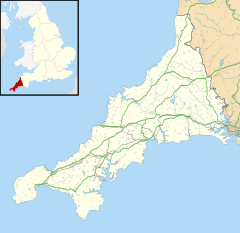 St Austell (/ˈɔːstəl/; Cornish: S. Austel) is a town in Cornwall, England, 10 miles (16 km) south of Bodmin and 30 miles (48 km) west of the border with Devon. St Austell is one of the largest towns in Cornwall; at the 2011 Census, it had a population of 19,958. Named after Saint Austol (Saint Austell is mostly unrelated), one of the earliest references to the village of St Austell is in John Leland's Itinerary, where he says "At S. Austelles is nothing notable but the paroch chirch". Not long after William Cookworthy discovered china clay at Tregonning Hill in west Cornwall, the same mineral was found in greater quantity in Hensbarrow downs north of St Austell. Clay mining soon took over from tin and copper mining as the principal industry in the area, and this eventually contributed enormously to the growth of the town. The clay industry really only came into its own during the mid 19th to early 20th century, at a time when the falling prices of tin and other metals forced many mines to close down or convert to clay mining. The success and high profitability of the industry attracted many families whose breadwinner had been put out of work by the depression in the local metal mining industry, and increased the population of the town considerably. This meant that more shops and businesses took root, providing more jobs and improving trade. This, along with other factors, led to St Austell becoming one of the ten most important commercial centres of Cornwall. Work began in 1963 on a brutalist-style pedestrian precinct which included shops, offices and flats. The design was by Alister MacDonald & Partners and the materials reinforced concrete with some stone facing. In the 2000s this area of the town had become very outdated, and underwent a £75 million redevelopment process. In August 2007, developers David McLean and demolition team Gilpin moved onto the town centre site to complete the preparation, with the Filmcentre which was originally an Odeon cinema dating back to 1936, being demolished in late September/early October. In October 2007, the South West of England Regional Development Agency (SWRDA) announced the new development would be named White River Place. It was also announced that 50% of shop units had been leased to High Street stores, with New Look, Peacocks, Bonmarché and Wilko opening new stores. This would mean New Look relocating from its current premises in Fore Street and the return of Peacocks to St Austell following the demolition of its old store to make way for the new development. Bonmarche has since closed. In October 2008, it was announced that the developer David McLean Developments had gone into administration and concern was expressed that this could jeopardise the completion of the project. In December 2008, the new White River Cinema opened its doors for the first time: the cinema is technically advanced and the first purpose-built cinema in Cornwall for over 60 years. The Torchlight Carnival was revived[clarification needed] in November 2009 as a direct result of public demand through a survey conducted with local residents. The Torchlight Procession has become an important event in the town's calendar, heralding in the Winter celebrations and drawing thousands of people from across Cornwall and Devon. The event is run by a small group of non affiliated volunteers. The St Austell and Clay Country Eco-town is a plan for several new settlements around St Austell on old Imerys sites. It was given outline government approval in July 2009. In July 2011, the Cornwall Council strategic planning committee voted to approve a £250 million beach resort scheme at Carlyon Bay, St Austell. The development was initially proposed in 2003. The arms of St Austell are Arg. a saltire raguly Gu. St Austell is in the parliamentary constituency of St Austell and Newquay which was created in 2010 by the Boundary Commission for England (increasing the number of seats in Cornwall from five to six). Before 2010 it was in the Truro and St Austell seat. The main local authority is Cornwall Council, the unitary authority created as part of the 2009 structural changes to local government in England. The six former Districts and the former Cornwall County Council were abolished and replaced by Cornwall Council on 1 April 2009. St Austell Town Council covering Bethel, Gover, Mount Charles, Poltair and Holmbush; represented by 20 councillors. Carlyon Parish Council covering Carlyon Bay and Tregrehan; represented by 9 councillors. St Austell Bay Parish Council covering Charlestown, Duporth, Porthpean and Trenarren; represented by 7 councillors. Pentewan Valley Parish Council covering Tregorrick, Trewhiddle, London Apprentice and Pentewan; represented by 9 councillors. Before this date the area had been an unparished area. St Austell is the main centre of the china clay industry in Cornwall and employs around 2,200 people as of 2006[update], with sales of £195 million. The St Austell Brewery, which celebrated its 150th anniversary in 2001, supplies cask ale to pubs in Cornwall and other parts of the country. Its flagship beer is St Austell Tribute; a number of other ales are brewed but are less commonly sold outside Cornwall. St Austell Brewery's first public house, The Seven Stars Inn, purchased in 1863, still stands today on East Hill in the town. Tregonissey House, the site of the company's first steam Brewery, built in 1870, can also be seen in Market Hill. A brewery museum and visitor centre is open to the public on the present brewery site in Trevarthian Road. As in much of Cornwall and neighbouring counties, tourism is increasingly important to St Austell's economy. Tourists are drawn to the area by nearby beaches and attractions such as the Eden Project, sited in a former clay pit, and the Lost Gardens of Heligan. The China Clay Country Park, in a former china-clay pit two miles north of the town, tells the story of the men, women and children who lived, worked and played in the shadow of the clay tips around St Austell. St Austell is home to several public houses, numerous high street retailers, and several independent shops, many of which cater for tourists. The town has a small museum which is situated in the Market House. A Brewery Museum and Visitor Centre is situated on the site of the St Austell Brewery in Trevarthian Road. St Austell Guardian, part of the Cornish Guardian series published by Cornwall and Devon Media Ltd, has a long history in the town and is published on Friday. Radio St Austell Bay is a local radio station which broadcasts from studios at Tregorrick Park. It launched in January 2008 to cover the area from Trewoon in the west to Tywardreath in the east. Notable Cornish architect Silvanus Trevail designed a number of St Austell's buildings and houses, including the Thin End and the Moorland Road terrace. Other notable architects from St Austell include John Goode, who contributed considerably during the 1970s to residential developments in the area. St Austell railway station was opened by the Cornwall Railway on 4 May 1859 on the hillside above the town centre. Two branch lines west of the town were later opened to serve the china clay industry; the Newquay and Cornwall Junction Railway which is still partly open, and the short-lived Trenance Valley line. The independent narrow gauge Pentewan Railway ran from West Hill to the coast at Pentewan. The Cornish Main Line in St Austell is quite renowned for its viaduct which passes through the Gover Valley and Trenance areas of the town. the original timber structure was designed by Isambard Kingdom Brunel, it was 115 feet (35 m) high, 720 feet (220 m) long on 10 piers; it was replaced by a new stone viaduct in 1899. There was a siding located west of the viaduct. In the early years trains from St Austell had to push wagons over the tall, curving viaduct to shunt this siding. The Great Western Railway's instructions stated that: "Trucks may be pushed from St Austell to the Siding, but when this is done the speed of the Train between the two places must not exceed 8 miles an hour, and the head Guard must ride on the leading vehicle, unless it be a bonnet end one, in which case he must ride in the first low sided vehicle from it, to keep a good look out, and be prepared to give a signal to the Driver either by Day or Night, as may be required". Train services today operate west to Truro and Penzance, and east to Plymouth and London. There are also three CrossCountry services on most days to the North of England and Scotland. The town's bus station faces the entrance to the railway station to offer an easy interchange between buses and trains. National Express coach services call here, a dedicated link operates to the Eden Project, and local buses operate to villages such as Fowey and Mevagissey. The town can be accessed by the A390 which by-passes the town to the south on its way from Liskeard to Truro, or by the A391 from Bodmin, or by the A3058 from Newquay. In addition there are the B3273 to Mevagissey, the B3274 to Padstow and the A3082 to Fowey. St Austell bus station is the main bus and coach terminus for the town. The bus station is located in the forecourt of the railway station, formerly a railway goods yard. The bus station was redeveloped again in 2008, the new facility being opened on 3 November. It now comprises seven stands and shares facilities such as a taxi rank and buffet with the adjoining railway station which is operated by Great Western Railway, a sister company to the main local bus operator. Local services are provided by First Kernow. Long-distance coach services are part of the National Express Coaches network. The Great Western Railway started to operate what they called 'road motors' from outside their railway station on 3 August 1908. These first services ran to St Columb Road via St Dennis. A bus garage was later provided nearby in Eliot Road, next to the railway's new goods yard. The network was progressively extended over the next twenty years, after which time the services were transferred to the Western National Omnibus Company, formed in 1929 to free the railway company from its bus services and avoid complaints about its transport monopoly. Western National has now become part of the FirstGroup and operates as First Kernow. St Austell has three comprehensive schools, Poltair School, formerly the grammar school, and Penrice Academy; together with Brannel School which is situated in the nearby village of St Stephen-in-Brannel. Cornwall College St Austell is a Further & Higher Education institution incorporating the former St Austell Sixth Form Centre and Mid Cornwall College of Further Education. The College is based at John Keay House, which is also home to the college group's headquarters. St Austell has its own hospital, St Austell Community Hospital, formerly called Penrice Hospital. The hospital provides a number of inpatient beds and services as well as a range of outpatient clinics. Maternity services are also provided on site at the Penrice Birthing Unit. The hospital provides some urgent treatment at its minor injury unit, with the Royal Cornwall Hospital at Treliske, Truro handling more serious cases. The church was originally dedicated to St Austol, a Breton saint associated with St Meven, but is now dedicated to the Holy Trinity. By 1150 it had been appropriated to the Priory of Tywardreath by the Cardinhams: this continued until 1535. There was originally a Norman church here, of which some remains may be seen. The present church is of the 15th century and is large because the mediaeval parish was also a large one: the tower is impressive. All four outside walls bear sculptural groups in carved niches: the Twelve Apostles in three groups on the north, east and south; the Holy Trinity above the Annunciation and below that the Risen Christ between two saints on the west. The tower can be dated to between 1478 and 1487 by the arms of Bishop Courtenay, and the walls are faced in Pentewan stone. There are holy wells at Menacuddle and Towan. A new organ was placed on the north side of the chancel in 1880 and the first recital was held on 22 April. The organ was built by Messrs Bryceson Brothers and Ellis and cost circa £600. The church is dedicated to the Holy Trinity, is Grade I listed, and seats 300. There is a Cornish cross in the churchyard which was found buried in the ground on the manor of Treverbyn in 1879. This cross was erected in the churchyard on a new base in 1879. Another cross is in the grounds of a house originally known as Moor Cottage. This house was built in 1819; the cross was brought from Hewas in the parish of Ladock. Wikimedia Commons has media related to Churches in St Austell. The parish of St Austell was part of the archdeaconry of Cornwall and Diocese of Exeter until 1876 when the Diocese of Truro was established. A new rural deanery of St Austell was established in 1875. The style of worship of the parish church is in the Evangelical tradition of the Church of England. The two chapels-of-ease are All Saints, Pentewan, and St Levan's, Higher Porthpean. In the 19th century the following parishes were created out of St Austell parish: St Blazey (1845); Charlestown (1846), Treverbyn (1847), and Par (1846 out of St Blazey and Tywardreath). There was formerly a Quaker burial ground at Tregongeeves, just outside the town on the Truro Road. It was covered by about 6 ft (1.8 m) of earth removed from the building of the new road in the 1960s. A high stone wall bounds the remaining acre of land; access can be gained through a wrought iron gate. Approximately forty of the headstones from Tregongeeves were removed and are now located at the Friends meeting house in the High Cross Street in St Austell, just below the high wall which surrounds St Austell railway station. That meeting house is still in use. Speedway racing first took place a venue called Rocky Park, under the name "St Austell Gulls". The sport was a hit during various years, between 1949 and 1963 at the Cornish Stadium – now Stadium Retail Park, home of Cornish Market World. The sport returned to the area in the late 1990s, in the Clay Country Moto Parc, located at Old Pound, Nanpean. The club operated as the St Austell Gulls for four years, until the club changed ownership, and moved up a league to the Premier League, re-formed as the Trelawny JAG Tigers, until site owners Imerys Minerals Ltd ended the lease. Speedway has not been held in Cornwall since. Many attempts have been made to re-introduce the sport, but none have got past planning permission. The two highest profile bids were at Par Moor Motor Museum and St Eval Raceway. The owner of the land for the Par Moor bid confirmed that he would rent the land for speedway but locals objected. The St Eval bid failed after residents expressed fears about noise. Stock car racing, promoted by 1950s Kiwi Speedway star Trevor Redmond, ran side by side with speedway on numerous occasions. Numerous championships were run here, including the 1972 BriSCA World Championship for Formula 2 cars, won by Jimmy Murray from N.Ireland. It closed its doors in 1987. St Austell Football Club was formed on 17 September 1890. In 1908 the club won its first trophy: the Cornwall Charity Cup. The club achieved some success in the late 1920s and 1930s, winning the Senior Cup and Charity Cup twice. In May 2009, the team won the Senior Cup with a closely fought 3–2 victory over Saltash United. Tregorrick Park is the home of St Austell RFC, St Austell Tennis Club and Cornwall Table Tennis Centre. St Austell RFC play in the Tribute Western Counties West league and the club supports two senior teams, a ladies team and 14 youth teams covering most age groups. Founded in 1963 St Austell RFC has played at the Tregorrick Park ground since their move from Cromwell Road in the 1980s to make way for the Asda supermarket. Tregorrick Park also hosts a gym, sports hall, squash courts, bar, function room and holds local events such as firework displays and schools cross country competitions. Wheal Eliza cricket ground is the home of St Austell Cricket Club, and is also used for Minor Counties matches. The club supports four senior teams, a ladies' team and youth teams. Facilities at Wheal Eliza includes two playing fields with their own changing room facilities enabling the club to hold two competitive matches every match day. The club also has a pavilion, scorebox, artificial and grass nets. In 2017, the St Austell Claycutters baseball club was established to compete in the South West Baseball League. They are considered to be the first baseball team in Cornwall. While the team are named and associated with St. Austell, all outdoor training and home games are held on the sports fields at Fowey River Academy in Fowey. ^ a b UK Census (2011). "Local Area Report – St Austell Parish (1170220638)". Nomis. Office for National Statistics. Retrieved 20 March 2018. ^ Leland, John (1964). "Part III". In Lucy Toulmin Smith. Leland's Itinerary in England and Wales. I. London: Centaur Press. p. 202. ^ Smith, John R. (1992). "Cookworthy and the Early Years". Cornwall's China-Clay Heritage. Twelveheads: Twelveheads Press/Cornwall Archaeological Unit. p. 3. ISBN 0-906294-25-8. ^ "St Austell Climate Period: 1981–2010". Met Office. Retrieved 10 November 2018. ^ "Records and Averages". Msn.com. 12 November 2018. Retrieved 23 November 2018. ^ Cornish Guardian, 27 October 2008. ^ "Eco-town home page". Cornwall Council. Retrieved 7 November 2010. ^ "'World-class' development approved for Carlyon Bay". Cornish Guardian. Archived from the original on 17 September 2012. ^ "Carlyon Bay development given the go ahead". BBC News. Retrieved 26 November 2017. ^ "Cornwall (Structural Change) Order 2008". Office of Public Sector Information. 25 February 2008. Retrieved 21 September 2009. ^ British Geological Survey (January 2006). "Kaolin Mineral Planning Factsheet" (PDF). Office of the Deputy Prime Minister. Retrieved 9 June 2013. ^ "Vues d'Italie; La Baie de Naples". vam.ac.uk. ^ Bennett, Alan (1988). The Great Western Railway in Mid Cornwall. Southampton: Kingfisher Railway Publications. ISBN 0-946184-53-4. ^ Binding, John (1993). Brunel's Cornish Viaducts. Penryn: Atlantic Transport Publishing/Historical Model Railway Society. ISBN 0-906899-56-7. ^ "St Austell Viaduct - St. Austell". wikimapia.org. ^ "National Rail Timetable 135 (Winter 2008)" (PDF). Network Rail. Retrieved 23 February 2009. ^ Cummings, John (1980). Railway Motor Buses and Bus Services in the British Isles 1902-1933, volume 2. Headington: Oxford Publishing Company. ISBN 0-86093-050-5. ^ "St Austell. Organ Recital On The New Church Organ". The Cornishman (94). 29 April 1880. p. 7. ^ Truro Diocesan Directory 2008. Truro Diocesan Board of Finance. pp. 60–61. ^ "Club history". St Austell AFC. Archived from the original on 17 May 2008. Retrieved 24 June 2009. ^ "Good luck to the St Austell Claycutters Baseball Club". Facebook. Retrieved 22 December 2016. Wikimedia Commons has media related to St Austell. Wikisource has the text of the 1911 Encyclopædia Britannica article St Austell.